eight bones arranged in two rows that articulate proximally with the radius and indirectly with the ulna, and distally with the five metacarpal bones; in domestic mammals, bones of the proximal row are called radial, intermediate, ulnar, and accessory, whereas distal row bones are termed first, second, third, and fourth carpal bones. the eight bones of the wrist, which are arranged in two rows, a proximal and a distal row, each consisting of four bones. The proximal row consists of the scaphoid (navicular), the lunate, the triquetrum, and the pisiform bones. The distal row consists of the trapezium (greater multiangular), the trapezoid (lesser multiangular), the capitate, and the hamate bones. Also called wrist. Eight bones arranged in two rows that articulate proximally with the radius and indirectly with the ulna, and distally with the five metacarpal bones. Synonym(s): carpus (2) [TA] . 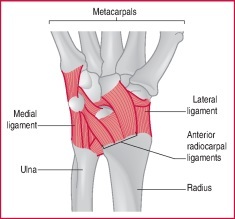 refers to the two rows of carpal bones between the metacarpal bones of the hand and the wrist joint. Syn carpus. Fig facing . Bones of the right wrist from the front. Right wrist and radioulnar joints, from the front. links the forearm bones to the proximal row of the carpal bones, allowing movement of the hand forward (palmar flexion), backward (dorsiflexion) and side-to-side (and combinations of these) by the action of muscles that have their origins in the forearm and around the elbow, and tendons that span the wrist to be inserted beyond it. wrist injury is most common in sports where a strong grip is required, especially with twisting, such as gymnastics, golf and tennis, or in throwing sports (causing soft tissue injuries), contact sports or where falls are likely such as boxing or horse riding (causing fractures). See also scaphoid bone. a (tarsal) bone in the foot and a (carpal) bone in the wrist. Latter is commonly damaged by compression, causing scaphoid fracture, when there is a fall onto the outstretched hand in hyperextension. If the fracture involves the proximal third of the scaphoid, there is a high risk of non-union and threat of avascular necrosis, due to the poor blood supply. Computed tomographic documentation of a comminuted fourth carpal bone fractures associated with carpal instability treated by partial carpal arthrodesis in an Arabian Filly. In a review of literature including hand published articles from 1935 to 2005, only 29 cases of GCT of carpal bones (averaged age of patients 32,6 years ranging from 16 to 80 years, data from three publications not available) could be found by Shigematsu et al. The rationale of carpal bone mobilization (CBM) instead of the unproven effects of the nerve gliding technique is that there is limited but promising evidence regarding its efficacy. Closed reduction of acute dislocations of the semilunar carpal bone. Sites of predilection include phalanges (100%), carpal bones (97. 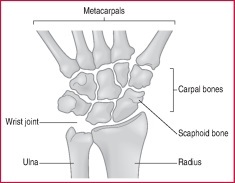 These carpal bones in turn articulate with five metacarpal bones. The eight carpal bones (situated in the area of the hand between the knuckles and the wrist joint) and four articulations (joints), of the wrist give it a complex anatomy that's vulnerable to degeneration and injury, says Peter Tang, MD, an orthopedic hand surgeon at New York-Presbyterian Hospital/Columbia University Medical Center and assistant professor of orthopedic surgery at Columbia University College of Physicians and Surgeons. The interosseous muscle is mostly tendinous, and originates from the second row of the carpal bones, the accessory carpal bone, the caudal aspect of radius, and the base of the metacarpal bones III & IV and runs against the palmar aspect of the metacarpal bones (Fig. Features analysis of the carpal bones can reveal the important information for skeletal age assessment. While investigating natural and human-caused mortality of moose (Alces alces) in Minnesota during 1972-2000, amount of marrow fat was estimated in femur, tibia, mandible, humerus, radius, tarsal, and carpal bones of individual moose.